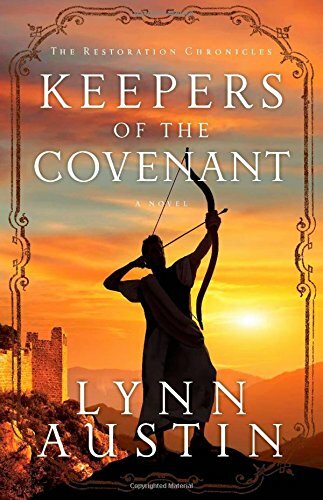 Christian fiction author Lynn Austin brings a second strong novel to readers of her Restoration Chronicles with Keepers of the Covenant. Fans of the author’s historical fiction will not want to miss this novel because relatable characters, a detailed and compelling plot, and lyrical prose bring the Old Testament to life. In Biblical times, quiet scholar Ezra just wants to study the Torah in the hopes of reaching fellow Israelites with God’s word. God’s chosen people, however, are threatened by outside forces determined to annihilate them and desperately need a leader. When the king of Persia calls for the decimation of the Jewish people because of a long-standing feud between God’s chosen people and the Gentiles, Ezra’s life is subsequently upended as he is chosen to lead the Israelites against their foes. For an introvert who prefers books to people, Ezra struggles to understand why God would put him into a leadership role; ever the follower of His laws, though, Ezra zealously takes his position with pride and determination throughout the entire novel. Keepers of the Covenant is Ezra’s story of leading the Jewish people through battles and trials as they fight for peace and prosperity in their homelands. Austin uses four primary characters to illustrate the struggles and joys of the Jewish and Gentile peoples of Biblical times. In the author’s characteristic fashion, the historical setting and timeline do not deter readers from connecting with her characters. Keepers of the Covenant readers will feel the pain, empathize with the plights, rejoice in the joys, and wonder about the confusion around them when Ezra, Devorah, Amina, and Ruben participate in and come through the battles of the Old Testament. One of Austin’s best strengths—and she has many—is her ability to ability to bring the Bible to life through relatable characters, accessible prose, and compelling storylines. Stories, lessons, parables, and more that have intimidated generations upon generations of people are somehow adapted through characters and situations that seem just like who and what readers would encounter today—and suddenly those Biblical stories are not so scary compared to what those same readers will hear from the altar. Keepers of the Covenant is a long novel, so Austin has a lot of material to work with, which drives the plot in exciting ways; however, as in any prose, longer length also gives the writer more room for error. Austin does not do anything wrong in Keepers of the Covenant—I really don’t think she could ever do any wrong—but her characters do not grow as much as the 450+ pages could allow them to, which does begin to drag the story a bit towards the end of the novel. Most readers will probably not pick up on this observation because the plot and characters equally drive the story, but a bit more fleshing out of certain characters would have helped develop a reader-character relationship with Ezra and Devorah. Keepers of the Covenant plays with numerous emotionally driven questions through Austin’s protagonists. She brings arguments about God’s decisions for His people when certain characters do not make it alive from battle. She discusses Old Testaments laws that are definitely out of place today but even during Biblical times were questioned. Austin also relates the intricacies of raising children in Jewish and Gentile households, which is especially interesting to consider in this novel because of the protagonists’ status within the communities. Along with these and other subjects that arise throughout Keepers of the Covenant, Austin retells the story of the Book of Esther, teaching her readers about Old Testament stories and culture without overwhelming them with Biblical facts or difficult language. Lynn Austin is an author whose back-cover blubs of her books I do not need to read before automatically selecting “pre-order” on Amazon or bringing the novel to the check-out counter at any store. I have read almost all of her novels and have loved each and every one. Keepers of the Covenant is one of my favorite novels of 2014, and I am already eagerly awaiting the next book in the series. More than anything, I want to thank Austin for helping strengthen my faith through her Restoration Chronicles novels. I would not nearly as much about the Old Testament as I do now because of her stories. I hope that is high praise an author seeks when they write historical Biblical fiction. I received this book courtesy of Bethany House Publishers in exchange for a fair and honest review; no monetary compensation was provided. This review was originally written for LuxuryReading, The Christian Manifesto, and Bethany House Publishers. 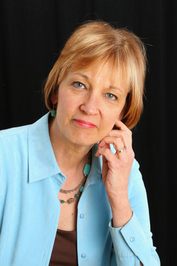 Lynn Austin has sold more than one and a half million copies of her books worldwide. A former teacher who now writes and speaks full time, she has won eight Christy Awards for her historical fiction. One of those novels, Hidden Places, has also been made into a Hallmark Channel movie. Lynn and her husband have raised three children and make their home near Chicago, Illinois. One of the best things about social media is the opportunity to meet new people through their blogs and other chosen interactive sites. 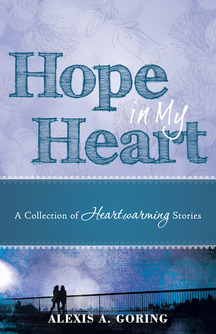 A few months ago I was blessed to “meet” author Alexis Goring, author of Hope in My Heart: A Collection of Heartwarming Stories. 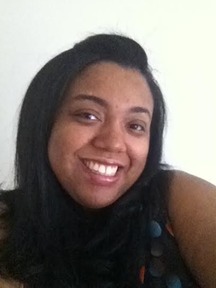 Join Alexis as she shares her story about the God’s blessings and gifts. All of my life, I have enjoyed reading and writing. The bookstore is one of my favorite places to spend time because I love reading a good book! I relish the scent, look and feel of a brand new book that’s fresh off the press. I enjoy admiring the book’s design and glossy cover. Reading the author’s bio, book summary and exploring the book from cover to cover bring me incredible joy! Whenever I begin journeying through a new novel, I become immersed in the characters’ lives and grow eager to turn the page and read what happens next. So if you haven’t figured it out already, I am a writer at heart. Since graduating from college with a degree in Print Journalism, I don’t read as much for fun as I used to but I certainly do write more than I used to and love it! When I write a fictional story, I enjoy exploring my characters’ personalities and motives. But most of all, I delight in creating scenes and situations where the desires of their hearts are granted. Prior to taking this opportunity to write a devotional for Marisa’s blog (thank you, Marisa, for hosting me on your blog today), I was thinking about that very fact of how I love giving good things to my characters in all of my fictional stories. While thinking deeply, that fact made me draw a parallel. The connection I made is this: Just like I (a mere mortal who creates fictional worlds on paper, telling creative stories filled with interesting characters) like to give good things to my characters and answer the desires of their heart in a wonderful way, how much more does God who created not only this real world called planet Earth but the entire universe, want to give good things to His children? Yes, that’s right, if you believe in God and follow His Son Jesus Christ then you are an adopted heir (Romans 8:17) which means you are one of God’s children and He loves you with all of his divine heart! Let’s look at the Weymouth New Testament version of the Bible (available online) and read Matthew chapter 7, verse 11, which addresses this very issue. God’s inspired Word says, “If you then, imperfect as you are, know how to give good gifts to your children, how much more will your Father in Heaven give good things to those who ask Him!” Yes, we as humans are imperfect but we as believers serve a perfect God! And He desires to give us good gifts. The plans the Good Lord has for us are beyond what we can imagine! Read Jeremiah 29:11 to learn of what type of plans God has for you and read 1 Corinthians 2:9 to learn just how amazing those plans are! Now there’s a blessing with your name on it! Your Father in Heaven wants to bless you with good gifts suited uniquely just for you and He wants for you—if you have not already—to believe in Him. We experience the very best of life when we are operating in the center of God’s will. Now that doesn’t mean that if you believe in God and follow Jesus Christ, you won’t have trouble (you will) but the good news is, God will: carry you through your trials, make a way for you to escape temptation, strengthen you, keep you and bless you with good gifts! Please keep in mind that gifts from God are not always monetary or material. He might give you the gift of time, the gift of life, the gift of healing and restoration. But no matter what gift(s) God has in store for you, know this it is good! Returning to my original point about stories, I like to think of God as the Master Storyteller. Not only did He create a world filled with interesting and talented characters but He is actively involved in writing the story of their life. Here’s a point to remember: A lot of times, we want to take control and write the story of our lives. While it’s normal to want to plan out your entire life and have a Plan A, Plan B, Plan C and be prepared with five to ten year goals, your life will be so much better when you release the reins to God and allow Him to lead you and direct your life story. I’d like for you to—if you haven’t already—consider turning your metaphorical pen over to the Master Storyteller and allow Him to weave a beautiful story of your life, one that leaves a lasting impression on your heart and in the lives of your fellow real-life characters in what I like to think of this amazing Book called Life. May God bless you with good gifts you want and He desires to give. FINAL CALL TO ENTER THE GIVEAWAY FOR THE WOUNDED WARRIOR’S WIFE! Exciting news! The Wounded Warrior’s Wife is now available for purchase as an e-book! As part of her book launch, Hannah is taking part in a blog tour featuring interviews and book reviews. 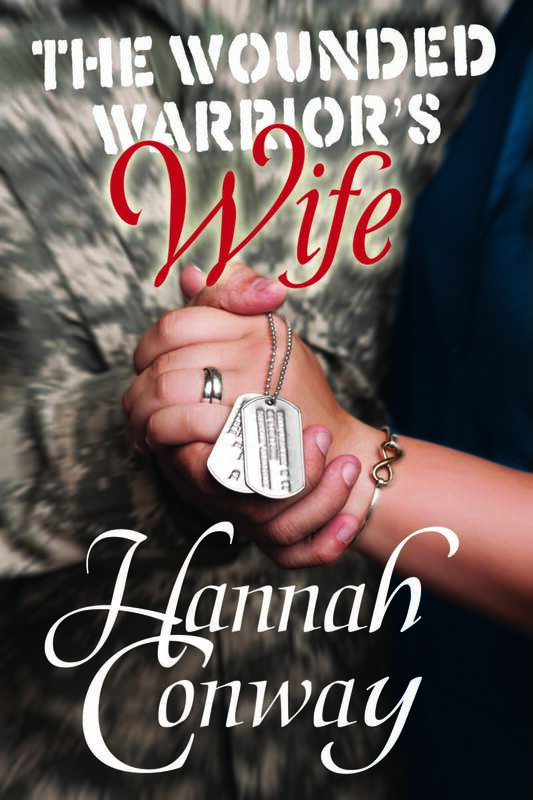 A few week’s ago I posted my review of Hannah’s debut novel, The Wounded Warrior’s Wife. 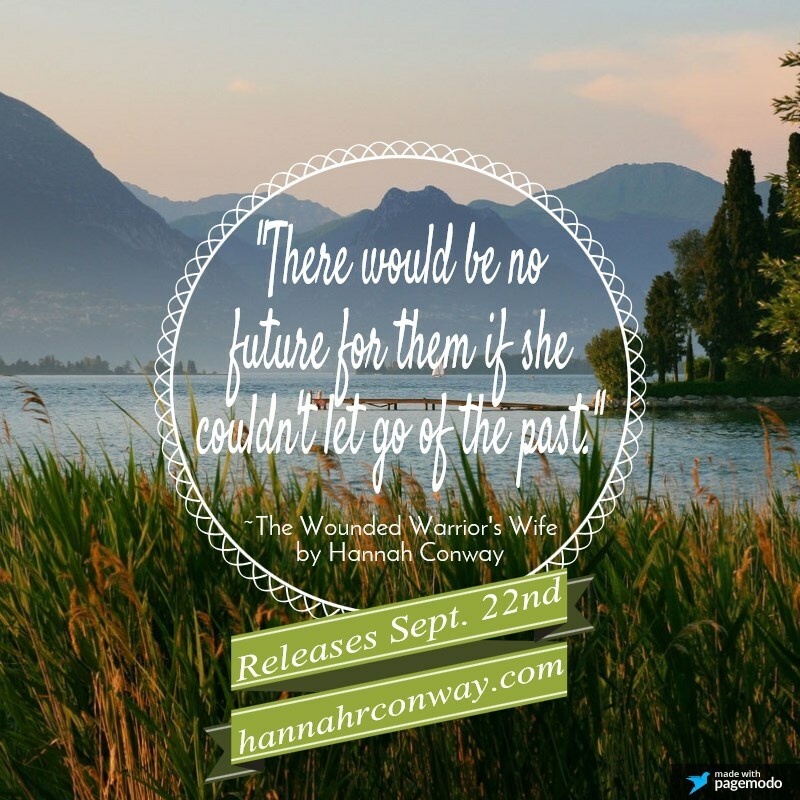 To celebrate the release of her novel, Hannah is making three appearances on my blog to share her thoughts on her writing process, the story behind The Wounded Warrior’s Wife, and future projects! I recently met Hannah in person at the ACFW conference in St. Louis. She is just as loveable and wonderful in person as she is through her social media sites. I know you all will enjoy meeting her just as much as I have! Hannah is offering a number of great prizes throughout her blog tour book launch! 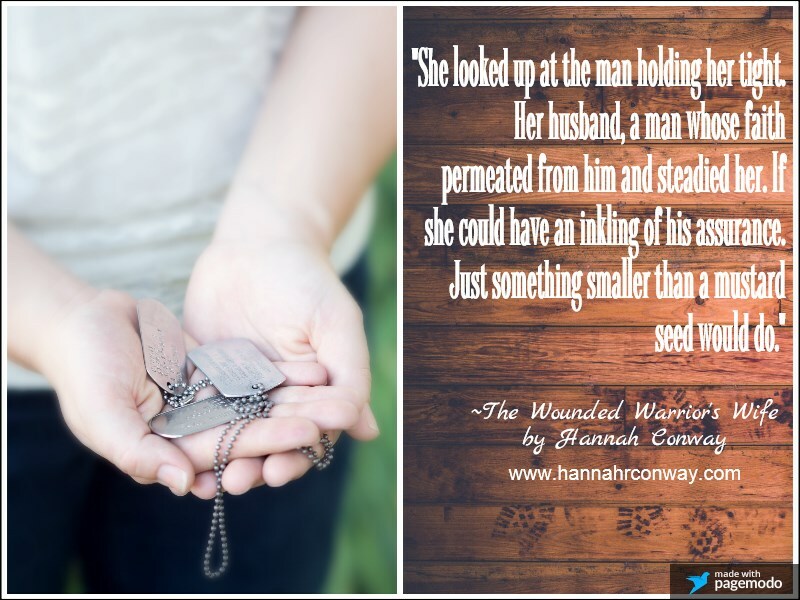 If you want to win an e-copy of The Wounded Warrior’s Wife or any other of Hannah’s giveaway prizes, make sure to read these interviews, comment on my post, like my page, and leave your contact information below (your name and your email address *follow this format* [your address [at] company [dot] com]). Other prizes aside from the book include $10 Amazon gift cards, groove passes (photos! ), and super-fabulous grand-prize in mid-November! Enter as many times as you’d like from the various sites Hannah will be visiting during her blog tour (full list available on her website). In our third session, Hannah shares with us the books that have impacted her life, new authors whose books she loves, what she would do if she wasn’t author, and more. Welcome back, Hannah! We’re so pleased to have you again on A Way With Words. 1) If you had to choose, which writer would you consider a mentor? I can’t name only one. My critique group (Shout-out ladies), have been amazing mentors. We’ve grown in our writing and friendship together. Also, Authors Joanne Bischof and Cara Putman were so kind to come alongside of me and give me pointers. They even took the time to look over my work and give honest feedback and direction. I will forever be grateful for them. I am reading Havah by Tosca Lee. TOTALLY recommend it! It’s the story of Eve and the Garden of Eden like you’ve never heard or imagined! 3) What books have most influenced your life most? The Bible, hands down, but if we’re talking others, that will have to be Redeeming Love by Francine Rivers and The Hiding Place by Corrie Ten Boom. Those books have stuck with me for years. Even with the struggle, hurt, and trials depicted, there’s something so beautiful about these stories. Maybe it’s the redemption, forgiveness, and restoration that takes place. Whatever it is, it has never let me go. 4) Are there any new authors that have grasped your interest? Yes! Dawn Crandall with The Hesitant Heiress, Elizabeth Byler Younts with A Promise to Return, and Autumn Macarthur with The Wedding List. SOOOO GOOD! Check them out! 5) If you didn’t like writing books, what would you do for a living? 6) Can you share a little of your current work with us? I’m currently working on a Novella Prequel to The Wounded Warrior’s Wife. It’s my FREE gift to my readers for all the kindness and support they’ve shown me. 7) What book do you wish you could have written? 8) Do you have anything specific that you want to say to your readers? I want them to know how much I love them, how special they are, and how much God loves them. I’m so thankful for my readers, and I love connecting with them. I enjoy when they share their lives with me and let me know how I can pray for them. It’s wonderful! WHITLEIGH CROMWELL dreamt of a happy life with her newlywed husband. Army Private First Class COLLIER CROMWELL loved God, his wife, and his country, though the military demanded he pay a high cost. When an unexpected deployment during the height of war sends Collier away for another year, their lives tumble down a path marked with struggle, and fatalities. War weary, and faith crippled, Collier brings home a war of another kind leaving Whitleigh staring at the shattered pieces of their broken marriage. Are there wounds too deep, and marriages too broken that they’re beyond even God’s ability to restore? 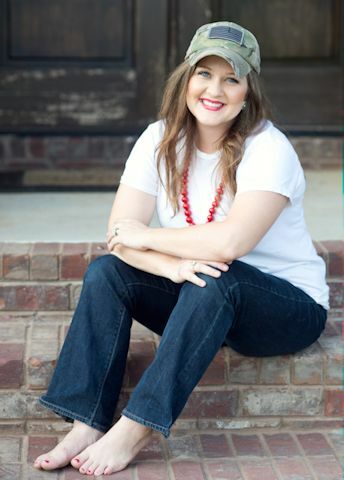 Hannah Conway is the author of The Wounded Warrior’s Wife and Wedding the Warrior. She is an Army wife of more than a decade, mother of two, writer and speaker. A Kentucky native, Hannah lives near Fort Campbell where she and her family are currently stationed. She holds a BA in History from the University of Colorado at Colorado Springs and is active in ministry, Mothers of Preschoolers (MOPS), as well as the American Christian Fiction Writers (ACFW), and My Book Therapy (MBT). 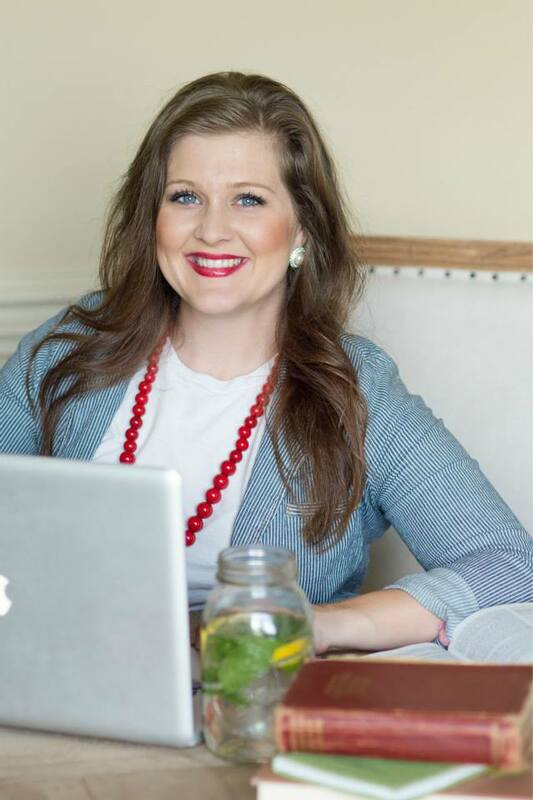 When she isn’t writing, you’ll find Hannah volunteering for community service projects, jogging (slowly), neck deep in Pinterest crafts, or browsing thrift stores. The most important thing about Hannah, is that she’s a follower of Christ. It’s her prayer that readers will come to know just how much God loves us through her writings. In our second session, Hannah discusses her inspirations, writing, processes, and the challenges and joys of being an author. Welcome back, Hannah! We’re so pleased to have you again on A Way With Words. 1) What inspired you to write your first book? I was inspired to write The Wounded Warrior’s Wife while struggling alongside my husband as he battled with PTSD (post traumatic stress disorder) and TBI (traumatic brain injury) from war-related injuries. Those years of our lives were the most trying and I have to admit there were times I wasn’t sure if we were going to make it. It was God who got us through and gave us a ministry to help others struggling with unseen wounds. 3) What does your writing process look like? Ha! It’s a long one. A lot like giving birth! The process, for me, isn’t as pretty as I thought it would be. I look a mess when I write. I have papers, books, and notes all around me. Gotta have my glass mason jar full of water and lemon by my side. My hair is crazy. At some point while writing I usually have to get up and go for a walk. Since I’m a Stay at Home Momma, it’s difficult to always carve out the time to write with my youngest needing a lot of my attention. Often I would wake up before the kids around 5am and write until they woke up. I pick a few nights a week and write from the kids’ bedtime until close to midnight. On a Saturday here and there my hubby would watch the kiddos while I hid somewhere to write. So it really is a long and crazy process. 4) Is there anything you find particularly challenging in your writing? Taking the time to describe or show the reader what I’m saying instead of simply telling them. It’s worth the effort, but goodness, sometimes it can be challenging. 5) Is there a certain type of scene that’s harder for you to write than others? Love? Action? I’m not sure if there is a certain type of scene that’s harder for me to write, but all of them can prove challenging. When I write I put myself in my character’s place in order to feel what they would feel and it can be emotionally draining. Several times I’ve had to stop writing and get a tissue to dry my eyes and blow my nose! Ha! 6) What is your least favorite part of the publishing / writing process? For publishing I’d have to say the endless edits, but at the same time, I know editing only helps me to grow as a writer. Regarding the writing process, I would have to say my least favorite part would be how emotionally attached I get to my characters. No kidding, I sometimes forget they are fictional characters! I may need counseling soon! 7) Do you have a favorite writing conference to attend? What is it? Yes! My favorite writer’s conference is the ACFW (American Christian Fiction Writers) Conference. The whole “as iron sharpens iron so one man sharpens another” Bible verse comes to mind with I think about the ACFW. They train, equip, and encourage writers to spread God’s love across the globe. LOVE them! In our first session, Hannah will discuss her debut novel: her inspiration behind the story, the making of her characters and their names, and the creative process behind The Wounded Warrior’s Wife. Welcome, Hannah! 1) How did you decide upon the title of The Wounded Warrior’s Wife? The Wounded Warrior’s Wife came to me even before the novel was finished. Being an Army Wife of an Infantry soldier who struggled with PTSD (post traumatic stress disorder) and TBI (traumatic brain injury), I related to the title on a deeply personal level. My husband was a wounded warrior and I was a wounded warrior’s wife. Simple as that. 2) How important are names to you in your books? 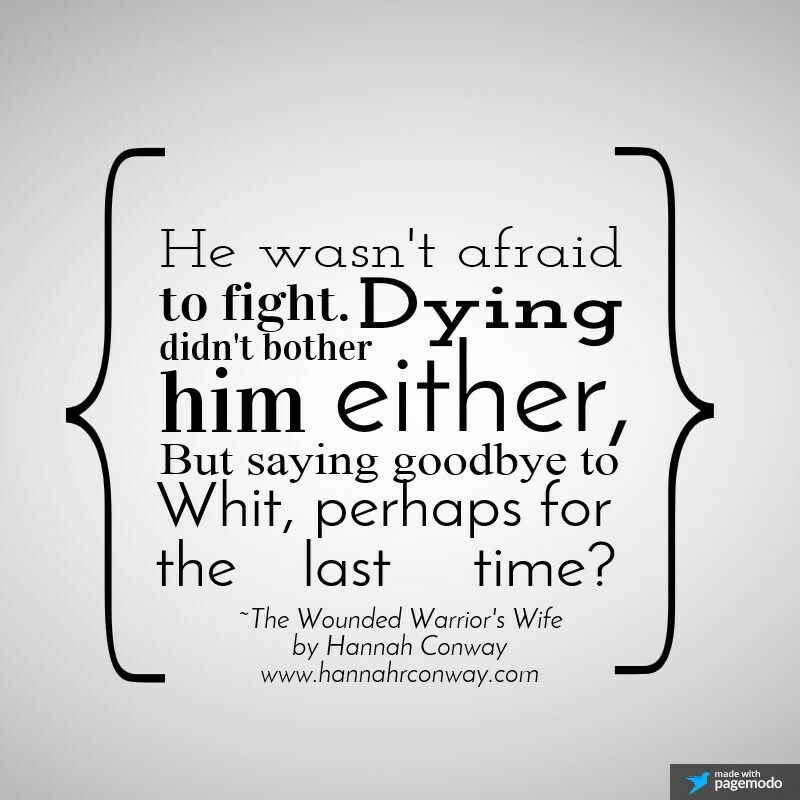 Do you choose the names of character in The Wounded Warrior’s Wife based on liking the way it sounds or the meaning? Do you have any name choosing resources you recommend? Ooh, I like this question. I’m a little quirky about names. Names are so very important to me. If I don’t like the meaning of the name or feel it doesn’t fit my character in some way, then I refuse to use it. I totally keep a baby names book close by equipped with meanings and spelling variations! 3) Are any experiences in The Wounded Warrior’s Wife based on personal experiences? Did you draw upon any stories or movies for inspiration for the novel? The Wounded Warrior’s Wife is deeply personal on many levels. Dealing with PTSD was an experience I related to with regards to the book. Like my main character Whitleigh, I struggled to adjust to military life. Like Whitleigh and Collier, my husband and I spent our first two years of marriage apart because of deployments. Those were hard times for us, full of fear and uncertainty. Our faith was definitely shaken, but as we sought guidance from God, our faith deepened. 4) If you could cast your characters in the Hollywood adaptation of your book, who would play your characters? 5) Did you have to travel much for research for The Wounded Warrior’s Wife? Sort of. I used places that we traveled to being in the military to create the atmosphere and scenery. 6) Was there anything in The Wounded Warrior’s Wife that you did not enjoy writing about?